My ho-hum morning had suddenly started sparkling. Because I knew that whatever was in that box was going to be both beautiful and delicious. That’s just how Harry and David rolls. 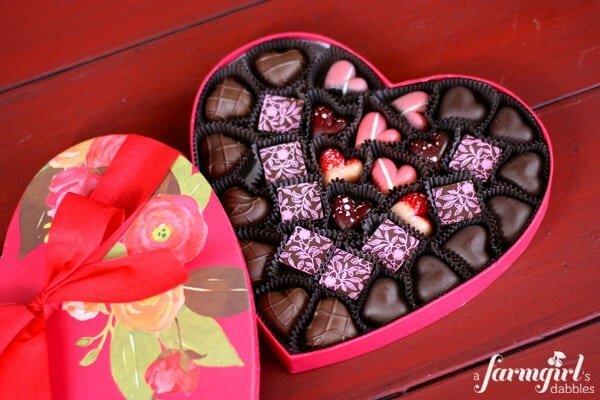 It’s been a loooooooooong time since I’ve received a heart-shaped box of chocolates. And never in such a pretty package. The chocolates were all so beautiful. But it was especially fun to recognize the colorful heart-shaped ones, as I witnessed the Harry and David test kitchen working on them when I visited their Oregon headquarters last fall. My memory instantaneously reached back to the sweet smells and wonderful people I met there. 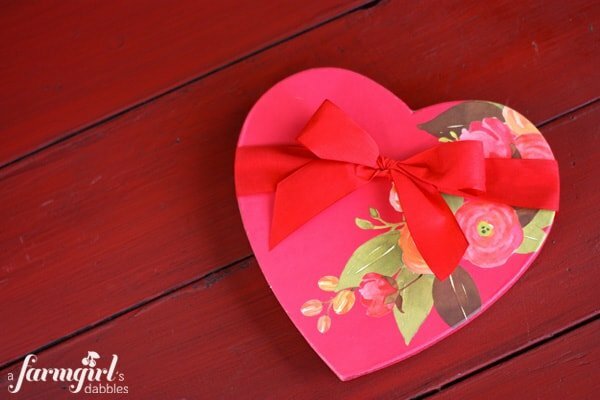 My dad used to give Mom a box of chocolates every now and then when I was a kid. And I always loved the key that was included, describing the flavors of each piece. (That’s how I became an expert at searching out my favorite dark chocolate pieces.) 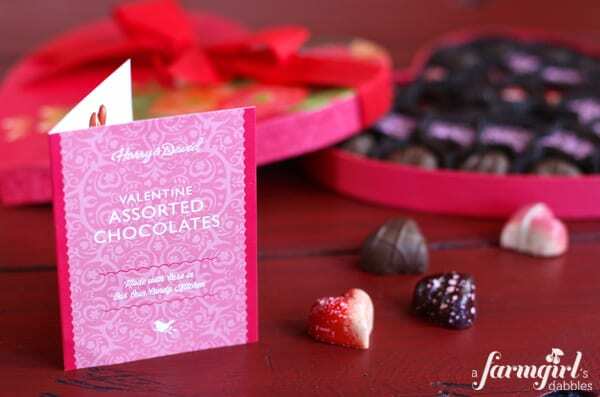 Harry and David does the same, with full color photos and explanations of each incredible chocolate. Our girls had so much fun matching up the descriptions and tasting them, and then showing their grandparents how to do it, too, when they came for a visit. This box of chocolates was a topic of conversation, and a very special and delicious treat for my family. Would you like to win this box of Harry and David chocolates? Just take a look at all the beautiful Valentine’s Day gifts that Harry and David has to offer! There are exquisite chocolate dipped strawberries, their signature (and juicy and perfect!) Oregon pears, striking red amaryllises in a handcrafted cedar box, tempting cheesecakes, and a fabulous line of new Harry and David wines (I was able to sample them when I visited Harry and David – they’re awesome!). There is something for everyone! This giveaway is now closed. The winner was “Karen”. Thank you to everyone who entered! Follow Harry and David and a farmgirl’s dabbles on Pinterest. Do you follow Harry and David and a farmgirl’s dabbles on facebook? If so, let me know for an extra entry. Follow Harry and David and a farmgirl’s dabbles on Twitter. This giveaway is open to US residents 18 years and older. Giveaway will end on Thursday, January 31st at noon, CST. One winner will be chosen at random and then notified by email. Winner will have 48 hours to respond and claim their prize, or another winner will be selected. A farmgirl’s dabbles and Harry and David are not responsible for lost or undelivered emails. Disclosure: This post was sponsored by Harry and David. 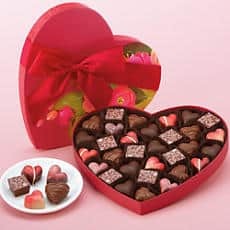 Thank you to Harry and David for providing my family with a beautiful box of chocolates to enjoy, and the chocolates for this giveaway. All text and opinions are 100% my own. And here’s that recipe for you! 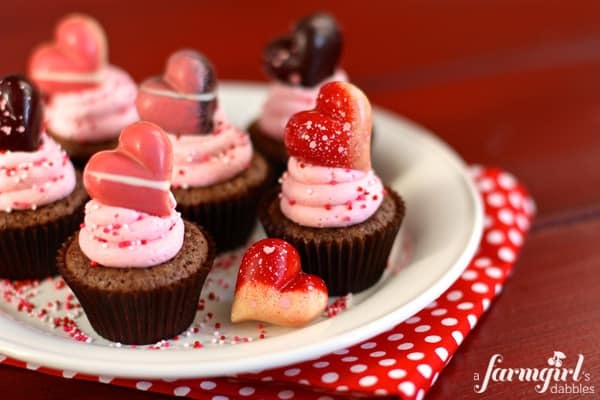 My family loved the Valentine’s Day treats I made with the Harry and David chocolates. 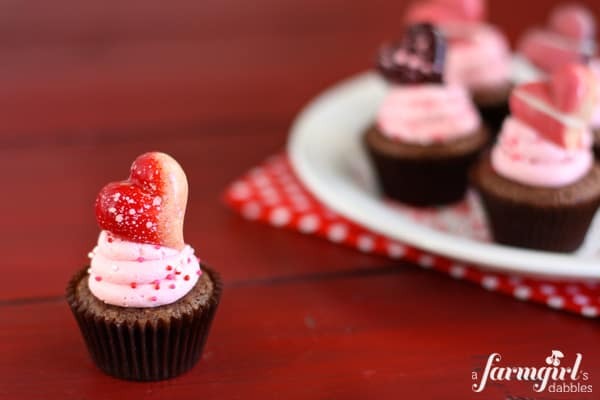 Comprised of our favorite family brownie recipe in mini cupcake form, with a swirl of pillowy strawberry marshmallow fluff frosting…well let’s just say they were a sweet little party in our mouths. 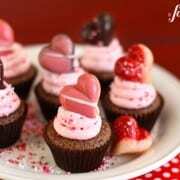 The frosting is quite simple to make and has wonderful texture and flavor. I’ll definitely be making these again! Enjoy the sweets. And Happy Valentine’s Day! Preheat oven to 350°. Line 2 mini muffin tins with 48 mini paper liners and set aside. In a large mixing bowl, stir together the sugar, oil, and eggs. In a separate medium bowl, whisk together the flour, cocoa, and salt. Add the dry ingredients to the wet and mix until incorporated. Stir in the vanilla. Spoon into 48 prepared mini paper liners. Bake for 10 minutes. Then turn the heat off and leave pan in the oven for another 5 minutes. Remove pan from oven and let cool for 5 minutes before removing individual brownie bites to a rack to cool completely. In the bowl of a stand mixer, beat butter until smooth and creamy. Add marshmallow fluff and beat just until combined. Add powdered sugar and jam, and mix until combined. Frosting will be a delicate light pink color. If you want the frosting to be a darker pink, add a little food coloring and mix to combine. Spoon frosting into a pastry bag fitted with a medium plain tip – I used a Wilton #12. Swirl frosting onto the tops of each brownie bite and then immediately sprinkle with nonpareils. 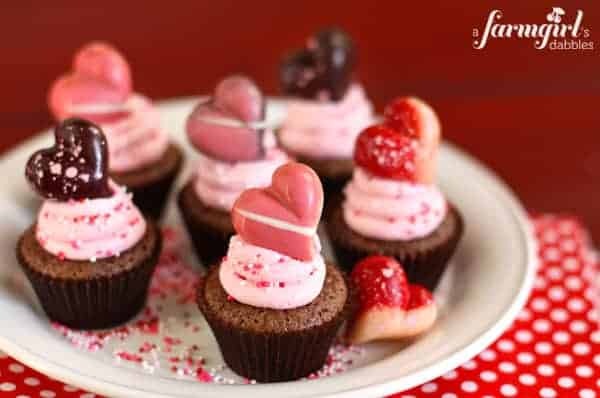 Gently press a heart-shaped chocolate into the top of each swirl of frosting. Beautiful! Brownies from our favorite family brownie recipe. Frosting from a farmgirl’s dabbles.